Blah, blah, blah, Bobby Flay, blah, blah. So yeah, the Ice Cream Man was on cable. There was a "throwdown" and our Greenwich shop prevailed with a sundae made from vanilla ice cream, warm apple topping, whipped cream, gourmet nuts, and a cherry. 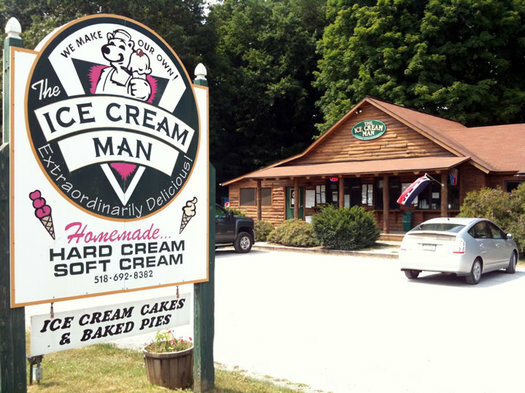 If you really want, you can buy one of those for $5.14, but then you would be missing out on what truly makes the Ice Cream Man special: they produce over 300 flavors of homemade hard ice cream. It's an audacious claim, but they make it proudly. Now granted, they only keep about 30 of the flavors on hand at any given time. Twelve are set in stone. They are the same week in and week out. Up to six flavors can be dedicated to fat-free, sugar-free, soft-serve, yogurt, or sorbet, which might be fine if you are into those kinds of things. That means every day hundreds of potential flavors are vying for a mere twelve spots on the menu board. After the Tour de Hard Ice Cream it became clearly evident that the Ice Cream Man sets the high bar for homemade ice cream in the region. But the question remained, what hidden delights are lurking on the menu. To find out, I decided to eat an unreasonable amount of ice cream. Again. Haphazard menu boards in ice cream parlors kill me. I find that my brain simply cannot process random data points of information. So to tackle this project, upon arriving at Ice Cream Man, I made a list of the available flavors and did my best to organize them into some meaningful scheme. For round one we tackled the basics. Danish Cream is essentially just the plain, sweetened ice cream base. And far from being boring, it's fantastic. 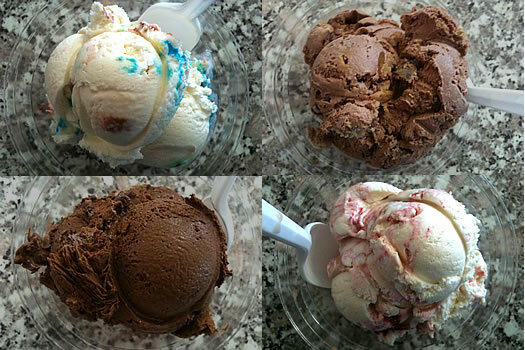 It has a dense, almost chewy texture, that can be found in many other flavors at the shop. This was the surprise winner of the round. Strawberry was excellent, with a muted natural color, and juicy bits of real strawberry studded throughout. Brownies and Cream was interesting. It is vanilla ice cream with chunks of homemade brownie. The biggest problem was the brownie itself was textually more like cake. However, as the ice cream began to melt and the brownie absorbed some of its runoff, this wilting cup became a favorite. Mint Chocolate Chip wasn't competing at the same level, but the chips were great. More on those soon. Round two brought the nuts. And if you like things sweet, maybe the butter pecan and maple walnut might be for you, but they weren't for me. However Chips Gone Nuts was my favorite flavor of the day. 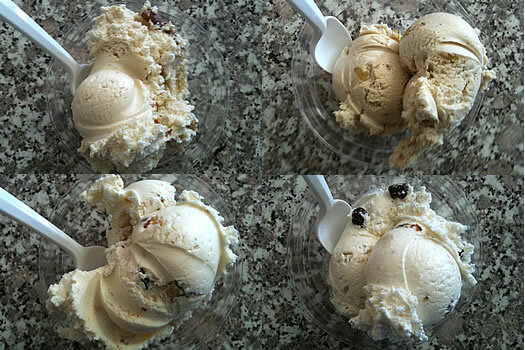 It was a simple affair of vanilla ice cream mixed with gourmet nuts and chocolate chips. But each piece was amazing on its own, and together it just popped. The sticky chewy vanilla ice cream provided a clean base for the rich and buttery nuts (I even spied some Brazil nut pieces in the blend), and those were contrasted by dark chocolate chunks that added further depth and complexity. What a shame it's not a regular flavor. Because it beat Almond Joy by a mile. The popular candy bar-inspired creation is billed as a coconut ice cream with chocolate-covered almonds. The thing about coconut ice cream is it can go one of two ways. It can taste like coconut cream or it can taste like coconut meat. The latter is delicious, the former tastes like sunscreen. Granted, it's very sweet sunscreen, but still. Round three brought the sweet sweet candy. By far the best thing was the Bear Tracks, which is chocolate ice cream with a peanut butter swirl, chocolate dipped waffle cone pieces, and nuts. When it comes to rich and heavy ice cream decadence, the combination of chocolate and peanut butter is pretty hard to beat. Heaven On Earth is vanilla ice cream with white chocolate chips and a raspberry swirl. I was expecting Albany Jane to be all over this one, given her love of white chocolate. But no such luck. Hugh's Chocolate Overload with double dark chocolate ice cream, a chocolate swirl, and chocolate chips sounded great -- but it turned out to be so icy that even the kids wouldn't touch it. They were less picky when it came to the beautiful M&M ice cream. I didn't realize that when these candy coated chocolates were suspended in ice cream that their shells would create a tie dye effect in the scoop. I also never truly appreciated how poor the quality of the chocolate is in M&M's. But when compared to the great texture and flavor of Ice Cream Man's chocolate chips, even the bright colors of the M&M's can't keep them from looking sad. Amazingly, all of these dishes were kids cups, because I thought they were pretty darn big. And each one is only $2. So you too can gather up your friends and family and eat through half of the menu for less money than movie tickets. This meal of 12 different ice creams will probably be a more memorable experience too. If you need to drive a respectable distance to get here, it makes sense to make the trip worthwhile. And this certainly filled the bill. + Keep it simple. The basics are great. + On the strength of their strawberry, I have high hopes for the other fruit flavors. + Their chocolate chips are delicious, as are the gourmet nuts. + If you get something with a brownie, let it melt a bit. + Avoid cheap candy bar flavors. 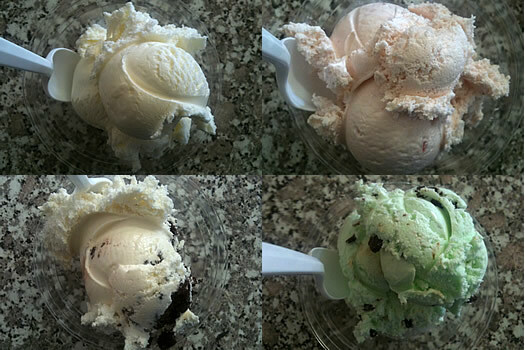 + And always ask for a taste, as it will keep you from accidentally ordering something that's gone icy. The funny thing is that right now I don't care that there are over 300 flavors. I just want my Chips Gone Nuts to come back. Be on the lookout. And I suppose there could be a flavor that's even better. So if you find it, let me know. Daniel B. is the proprietor of the FUSSYlittleBLOG. Love the Ice Cream Man! (My personal favorite is their chocolate peanut butter cup, but now i'm definitely going to try the chips gone nuts.) Worth noting, their ice cream is also available by-the-scoop at Coffee Planet in Ballston Spa. 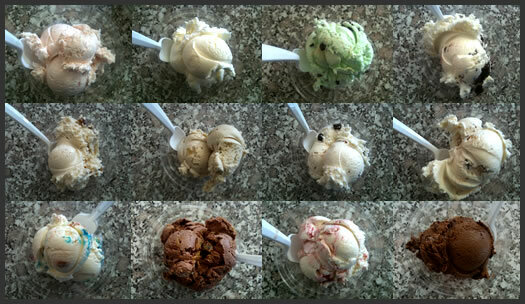 Have you done an ice cream tasting at the Battenkill Valley Creamery in Salem? Might be worth a drive. We've been eating a lot of Hugh's Chocolate Overload that I found at the Meat House in Albany and it's fabulous. We haven't had a problem with iciness after going through a few cartons of the stuff. I'll have to check out that Danish Cream. It sounds like a reasonable replacement for the Sweet Cream ice cream that we used to bring back from the now defunct Page's Ice Cream in West Brattleboro, VT. That was the best ice cream ever to top with fresh berries or to put on top of a piece of warm apple pie. I should really make a trip down there - it all sounds delicious! I first tried their ice cream after eyeballing it at the Meat House in Clifton Park, but so far, I've stuck to the ginger ice cream. It looks like there are lots more to try - yum! 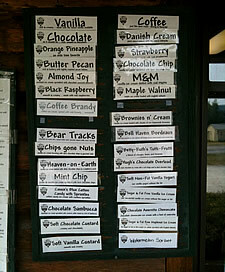 And now you know why I compulsively check the Ice Cream Man's facebook flavor updates for two words ... Bear Tracks. I want to go. It's so far. I eyed Chips Gone Nuts last time I was there -- glad I didn't get it now, 'cause I suspected it might have Brazil nuts (eew), and it does. But the flavor I did get, Mocha Madness or something like that iirc, was really, really good. Why don't more people put chocolate-covered coffee beans in ice cream? It was great. I love our food field trips. Next time we try the boozy flavors. Your food posts are one of the great things at AOA. Thanks! Nice someone from AOA finally mentioned this hidden treasure! Have known about this gem for years! My favorite radio station The Moon (WABY 1160) gives $15 gift certifiates to it every week on Gere Crouse's show!